Manfrotto have announced a distribution partnership in the UK with Shoulderpod. Consisting of the G1 Grip, S2 Handle Grip, R2 Pocket Rig and the X1 Pro Rig; the Shoulderpod range is designed to be a modular system. The G1 is a professional grip for mounting your smartphone on any tripod or rig. Fully adjustable for holding any smartphone model, it also works as a portable stand for holding your camera when on the road. The S2 is the first professional handle grip with three functions. It works as tripod mount, filmmaker handle, and traveller stand. It is a solid and portable solution for holding your smartphone camera and fits most devices thank to the adjustable mechanism. The R2 is a multifunctional and compact rig that makes adding external microphones, lights or batteries to your mobile camera easy when on the move. The X1 (pictured) is an advanced production rig that allows you to add professional microphones, light and extra batteries to your mobile camera. It can be quickly constructed for use as a handheld system, or for use with a tripod. Designed to slip easily into your backpack, the X1 is a fully adjustable system that will is fully compatible with other photo and video equipment, allowing you to turn your smartphone into a professional photo or video taking tool. Prices start from £24.90. Manfrotto, world leader in the photography, imaging equipment and accessories industry, has announced a distribution partnership in the UK with Shoulderpod. A platform designed to be a modular system, Shoulderpod produces high quality products for photographers, filmmakers, journalists and travellers who want to tell their stories by using smartphones as a professional camera. The G1 is a professional grip for mounting your smartphone on any tripod or rig. Fully adjustable for holding any smartphone model, it also works as a portable stand for holding your camera when on the road. It is extremely secure thanks to the adjustable thumb screw and wide rubber pacts. Built to last a lifetime, the G1 will help to transform your smartphone photos. A high quality handle grip with three functions, the S2 is the first professional handle grip with 3 functions. It works as tripod mount, filmmaker handle, and traveller stand. It is a solid and portable solution for holding your smartphone camera and fits most devices thank to the adjustable mechanism. 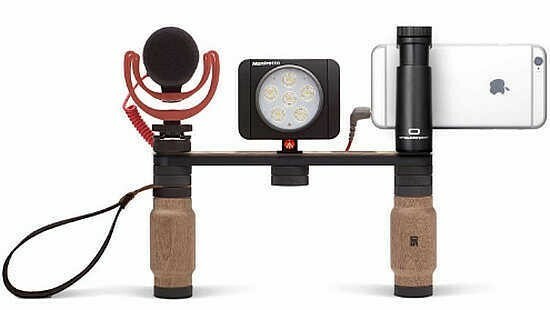 The R2 is a multifunctional and compact rig that makes adding external microphones, lights or batteries to your mobile camera easy when on the move. Including the G1 grip and a pocket rig to allow you to take your filmmaking studio wherever you go, the R2 has been designed and crafted using aluminium and natural Sapeli hardwood. The X1 is an advanced production rig that allows you to add professional microphones, light and extra batteries to your mobile camera. It can be quickly constructed for use as a handheld system, or for use with a tripod. Designed to slip easily into your backpack, the X1 is a fully adjustable system that will is fully compatible with other photo and video equipment, allowing you to turn your smartphone into a professional photo or video taking tool. Shoulderpod products are made in Barcelona using only the finest material for each and every part. Designed for image makers to get the best out of using their smartphones as camera, the modular system means that videographers, photographers and travellers only need to take the parts they need before every trip and so avoid carrying a heavy backpack full of unnecessary gear. The Shoulderpod range will be distributed by Manfrotto Distribution, Manfrotto online shops and authorized dealers. Prices start from £24.90. Manfrotto is the world leader in the design, production and distribution of professional products for photography, video and entertainment. The company was founded in 1972 based on Lino Manfrotto’s experience, and its mission has always been to support and simplify the work of reporters, photographers and producers. The Imagine More project adds to this historical mission the idea of fuelling the enthusiasm of weekend photographers and supporting the surge of new amateurs. Part of the UK-based Vitec Group since 1989, Manfrotto has now become a worldwide presence. In its eight key markets – Italy, France, Germany, the United Kingdom, China, Japan, Hong Kong and the United States – it is represented by its own direct distribution system, Manfrotto Distribution, whereas in 80 other countries sales are handled by independent distributors.